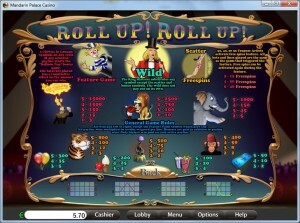 Inspired by the circus, “Roll Up! 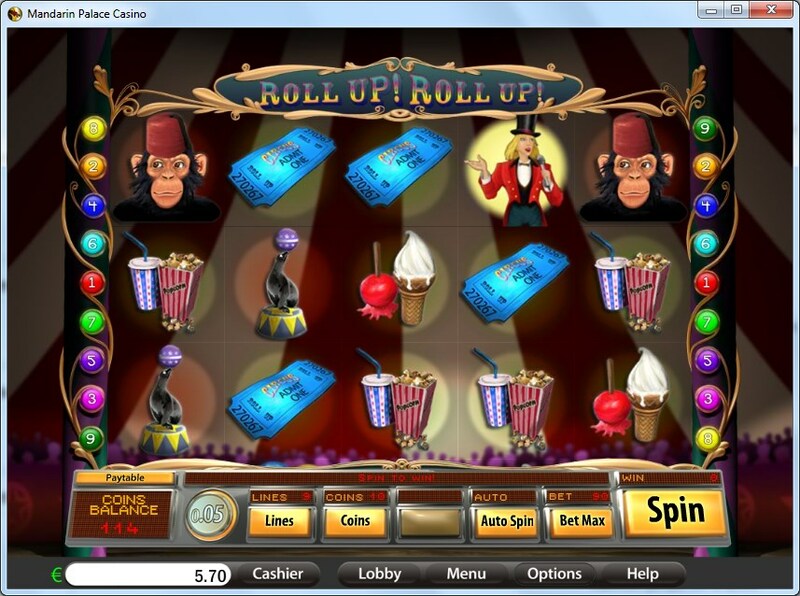 Roll Up!” comes from Saucify, a well known developer, which in the past was called BetOnSoft. The circus is visible in all the symbols used by the game, from the entrance tickets, to the animals that are performing, to acrobats, clowns or fire breathers. They’re all present on the reels of this game, which looks like fun even before you get to the features which are available inside. 5 reels with 9 bet lines are present in this game, while the feature list mentions wilds, free spins, bonus games and a couple of scatters. The top rewards you can count on are worth up to $15,000. Features of Roll Up! Roll Up! 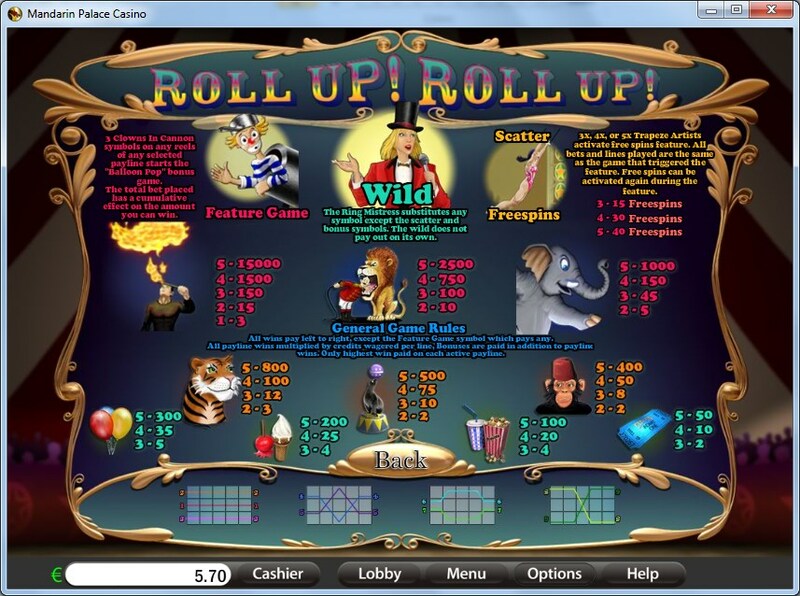 The game has as features bonus games, scatter symbols, free spins and wilds. They’re all normal features, but games that don’t have them feel average at best these days. In one of the most important roles in this game we will find the Ring Mistress. As the wild symbol, she is going to substitute for other icons, but only when the position is on a payline which has the rest of the required symbols already. If that is the case, the wild will provide the missing symbol, either forming the combo or improving an existing one. It doesn’t offer its own prizes, and it doesn’t apply multipliers, but that doesn’t make it less useful. You will find the Trapeze Artist on the symbol with a scatter role which gets you access to the free spins. You can win 15, 30 or 40 games for free, when you have 3, 4 or 5 scattered Trapeze Artists, respectively. The free spins can be triggered again. This is the bonus game of the slot and it needs you to get three symbols with the Clown in Cannon image, before you can enter it and get its prizes. The prizes you win in this bonus game are influenced by the total bet which was used in the round which triggered it. Given the small number of lines which are present in the game, the bets will not get to a very high level, which is a good thing. You have 9 lines you can bet on, with up to 10 coins selectable for each one. The denomination of the coins is very low though, only going up to $0.10, so the largest line bet will be worth $1, while the total for the game will be $9. You can get 150,000 coins while playing this game, if you land the right combo, but it will only mean $15,000 cash. It’s a 15,000x multiplier though, and that’s a very good reward from a slot machine. The big circus tent is shown in the background image, with lights being on the symbols which appear on the reels. It’s a nicely decorated game, with beautiful symbols and graphics surrounding the reels. Only themed icons are used inside, another plus in the game’s favor. If you enjoy going to the circus, or you simply have some great memories there, you will enjoy what the slot has to offer. Symbols: Clown (scatter), Ring Mistress (wild), Trapeze Artist (scatter), Fire Breather (15,000x), Lion Trick (2,500x), Elephant (1,000x), Tiger (800x), Seal (500x), Monkey (400x), Balloons (300x), Ice Cream Cone (200x), Pop Corn (100x) and Ticket (50x). It is an entertaining game, with all the right features inside, along with the graphics to back it up. I’d play it again, and I recommend you do the same if you enjoy the circus experience. The fact that it offers 15,000x payouts can only help its case. You will find Roll Up! Roll Up! 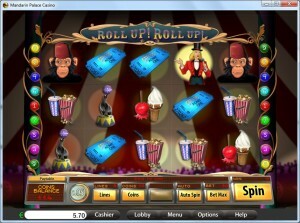 at any online casino which chooses to use software from Saucify/BetOnSoft , playable either for free or for real money.